I'm EXICITED again. You know when I get Excited I have been inspired. Thanks to Vanessa @ Southern in My Heart and Inspiration Friday I thought I would start a "Cupcake Sunday" party and you all can join in with your wonderful creations. 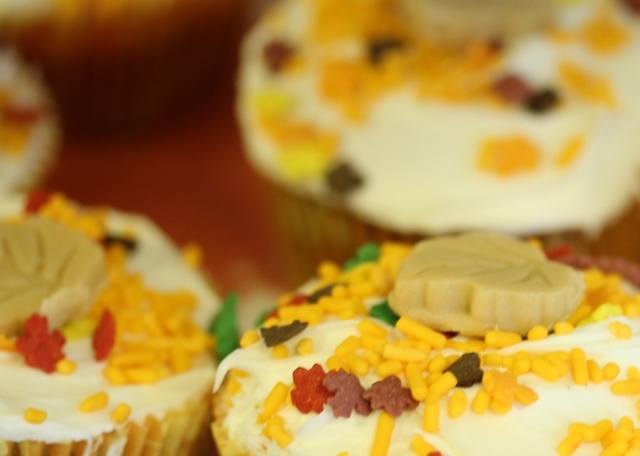 I would bake cupcakes once a month, decorate them (learn something new) and take the cupcakes to church for our Sunday coffee hour. I know the kids (young and old) would love them. Starting on October 24, 2010 I will have a Linky and button ready. 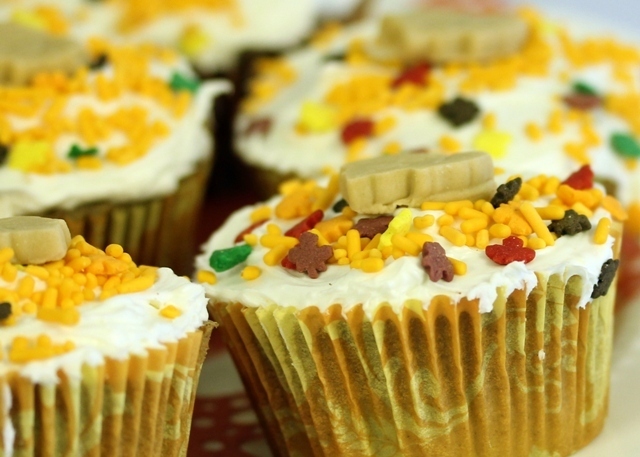 We all can have fun baking cupcakes for our blog and then a family dessert. YUM...... A win win. I love cupcakes. They are small and delicious to eat with ice cream. Just the right portion size. LOL. I baked the cupcakes today. 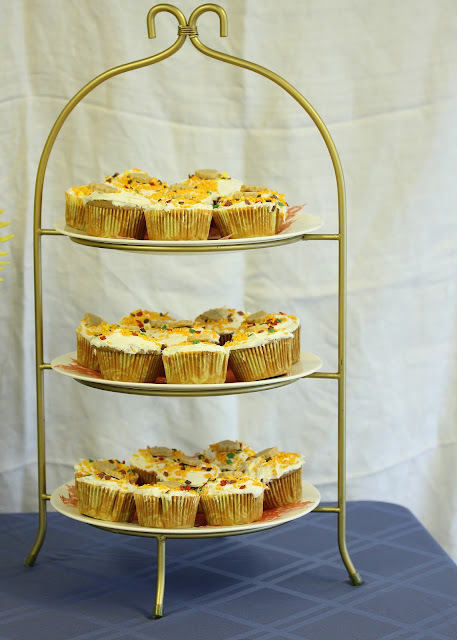 Took them to our church dinner tonight and photographed the cupcakes on the dessert table. The white material behind the cupcakes is covering a black chalk board. We had so many desserts the cupcakes and other desserts are going to be rerun tomorrow at the Sunday coffee hour. I hope you will join me on October 24th for some fun. It is a great time of the year to start baking. With all the holidays and company we are going to have in the coming months, I am sure there are going to be some wonderful cupcakes to share with our loved ones. My first Cupcake Sunday introduction. 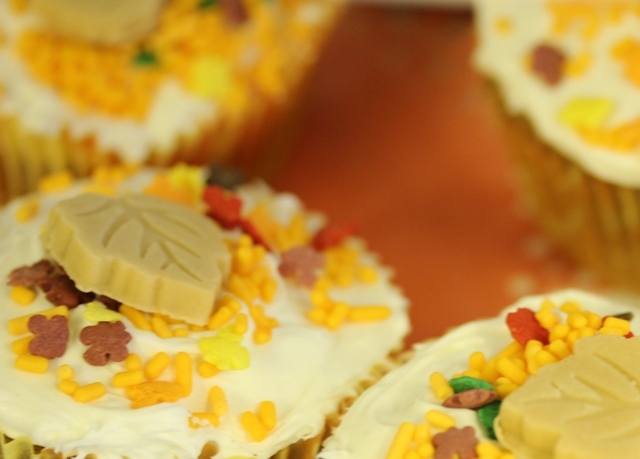 'Falling Leaves' fall decorated cupcake papers. Spice cake mix. Canned White vanilla frosting. Fall sprinkle decorations from Michael's craft store. Very basic. No frills. 20 minutes baking time and 30 minutes frosting time. So I'm Excited. Something new to learn and share. I'm also Excited about sharing my home. My garden. My travels and of course My Cozy Corner goodies in the next few months. Thanks for visiting today. I'm having an amazing time blogging. ﻿Please link back and visit the wonderful Seasonal favorites on Sunday. 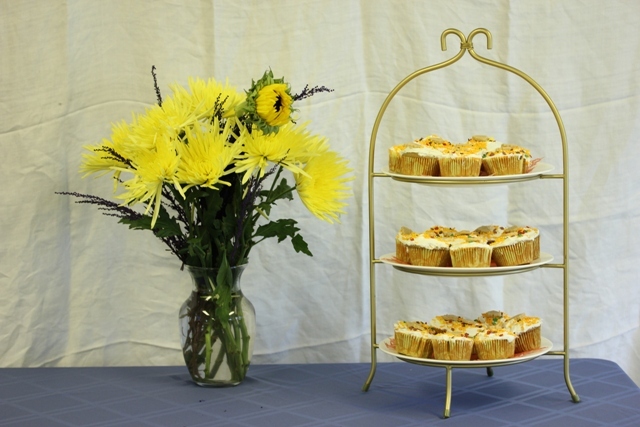 The cupcakes look yummy and your event sounds wonderful! Such adorable cupcakes.I love that they're so easy. I've often thought about trying fondant and now you've given me the inspiration to go through with it. Oh, and I just became your newest follower. I'm curious to see all of the inspirational cupcakes. OK, I'm back again. Somehow I can't sign up to be a Follower. I'll try again later. Love the idea of the cupcakes, I hope I can remember! I would like to join in. I have some little cupcakelets in my post today! Happy 50th! My sis had hers in June. Good health to you and dh! They're almost too pretty to eat! We have a new cupcake shop here in town. I love those pretty cupcakes! I will try my hardest to join in with your linky party-it sounds fun! Yum, your stuff looks so delish. I don't even need a bite, just looking at it makes me satisfied.